Written by Catherine Saxelby on Friday, 14 December 2012. If your child has an underlying sensitivity, food allergy or intolerance, you may see a range of behaviours including hyperactivity, irritability, aggression or confusion after they've eaten certain foods. If you think this applies to your child, talk to your doctor or an accredited dietitian. They can help you take steps to identify the culprits. The Royal Prince Alfred Hospital in Sydney uses their Elimination Diet to test food sensitive children. While this should only be done under supervision, some families have noticed improvements by reducing their child's intake of preserved, coloured and highly flavoured foods. If your child is hard to handle after a party, it doesn't automatically mean they have ADHD (Attention Deficit Hyperactivity Disorder). Children suffering from this disorder show the classic symptoms of ADHD (hyperactivity, lack of concentration and impulsivity) most of the time, both at home AND in the classroom - not just after a party. Remember only a small number of ADHD children are food sensitive. Behaviour is just one of a number of ways that food sensitivity shows itself. Chemicals in food can also trigger skin rashes, stomach pain, vomiting, loose motions, headaches, mouth ulcers, a runny nose or hay fever - as well as bad behaviour. Food triggers can be EITHER additives or natural chemicals such as salicylates (in many fruit juices), amines (in tasty cheese) and glutamates (in soy sauce and mushrooms). The most common culprits are colours in foods like cordials, soft drinks, snack foods and lollies. Other additives that can cause reactions are preservatives, antioxidants and flavour enhancers. Sugar - white or brown - doesn't contain problem chemicals and doesn't have to be eliminated but it shouldn't be over-indulged in either! Not all colours are artificial or cause problems. 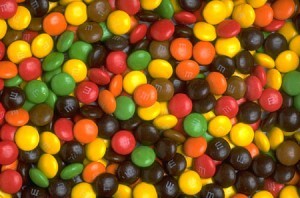 Recently there has been a move towards using more natural colours in foods, especially food intended for kids. instead of red No 122 (azorubine) or red No 129 (Allura red AC). curcumin (100), the natural colour from turmeric or paprika. browns which come from caramels (150a-d). The red food dye erythrosine (127) has been restricted since 1997 to only colouring maraschino cherries as no other red colour will hold. Tartrazine (102), a yellow colouring, is suspected of provoking asthma, urticaria (hives) and mood changes. Sunset yellow FC (110), Amaranth (123) and Brilliant Blue FCF (133) are under a cloud for being potentially carcinogenic or for triggering reactions ranging from bad behaviour and wakefulness at night to skin rashes. Here is a list of fun party foods that are safe for kids who react to food. All the brands listed are FREE FROM the trigger chemicals - other brands may not be. brightly-coloured soft drinks, tomato sauce, sausages, seasoned chips and coloured lollies. Foodwatch A to Z is a handy, pocket-sized book that lists additives, allergens and culprit chemicals. It's easy to take with you when you go shopping and is available from the Foodwatch online bookstore. Another great help is Friendly Food by the Royal Prince Alfred Hospital which includes recipes, additives to avoid and tables of the natural chemical loads in foods and is available online at www.sswahs.nsw.gov.au/rpa/allergy/. The assistance of dietitian Jane Dostine, Allergy and Intolerance Dietitian is gratefully acknowledged. Additives – why do they use them?